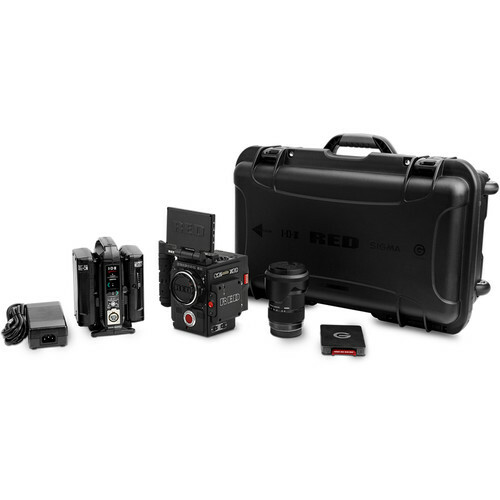 This RED DSMC2 DRAGON-X Camera Kit is part of the RED 2018 unified DSMC2 lineup and includes the RED DRAGON-X BRAIN, as well the minimum gear you need to make a functional shooting package. The DRAGON-X BRAIN features a Super35 sensor and can shoot and record at 5K uncropped up to 96 fps. The kit includes the Sigma 18-35mm f/1.8 DC HSM Art Lens and an aluminum Canon EF mount with electrical contacts that pass metadata and allow for electronic control of EF mount lenses. The included V-lock expander module allows you to power the camera and provides HDMI and SDI outputs, as well as other interfaces. The RED Touch screen mounts directly on the BRAIN with no cables and provides you with a viewing screen, allowing you to set up and control the camera. The IDX batteries power the camera, and the charger allows you to charge both batteries simultaneously. The 480GB RED MINI MAG captures your footage and supports data rates up to 300 MB/s, and the included reader enables transferring your footage off the MINI-MAG. The Outrigger Handle provides a handgrip, and the included case is designed and built to hold your camera and accessories safe during transport and storage. Bundling high performance raw video recording in a compact camera body, the RED DIGITAL CINEMA DSMC2 BRAIN with DRAGON-X 5K S35 Sensor is part of RED's 2018 unified DSMC2 lineup. Nearly limitless lens options are available for the DSMC2 system. While this camera requires a separately available lens mount, DSMC lens mounts themselves are offered in different varieties for compatibility with a wide array of lens systems. REDCODE RAW is the format of choice for DSMC2 cameras. RED's versatile raw codec uses wavelet compression to reduce data rates while maintaining a visually lossless image rendering. This efficient codec can be edited on many available NLE software programs without transcoding, though if you prefer you can record to ProRes or DNx as well. Lowering the recording resolution allows the sensor to capture higher frame rates for dramatic slow-motion footage. The DSMC2 cameras use sensor windowing to record slow motion in lower resolutions, requiring wider or smaller-format lenses to compensate for the additional crop. Recording rates range from 12 fps and up, including 24/25/30/48/50/60 fps and higher. The cornerstone of RED's workflow is the robust REDCODE RAW file format. Using wavelet compression with ratios ranging from 2:1 to 22:1, REDCODE RAW offers the versatility of raw files without the overwhelming storage requirements of uncompressed image data. Since REDCODE RAW has been around since the days of the RED ONE cinema camera, many common NLE software programs including Adobe Premiere Pro, Blackmagic Design DaVinci Resolve, Apple Final Cut Pro, and Avid Media Composer can import and edit REDCODE RAW footage without transcoding, saving production time in the edit suite. Capture rates range from 12 fps and up, including 24/25/30/48/50/60 fps and higher options. The Canon EF-mount Sigma 18-35mm f/1.8 DC HSM Art Lens is a wide-angle to normal-length zoom that features a fast, bright constant f/1.8 maximum aperture. It is specifically designed for use with APS-C-sized sensors and provides a 35mm-equivalent focal length range of 28.8-56mm. This aluminum RED Digital Cinema DSMC Canon Mount attaches to your DSMC or DSMC2 camera brain providing an EF/EF-S compatible lens port for your camera. Dual locking rings secure your lens in the mount, minimizing play. The mount features captive screws, so you don't have to worry about accidentally dropping a screw into the sensor cavity. The mount supports electronic communication between the lens and the camera, although not all functions may be supported. RED DSMC mounts are designed to be swapped without requiring a backfocus adjustment. More than just a way to power your camera, the RED DSMC2 V-LOCK I/O Expander provides a variety of input/output connections in addition to a V-Lock mount for your DSMC2 camera. The Expander is made from magnesium, so it is lightweight yet strong. It enables powering your camera from a V-Mount battery or by an alternate DC source via cable, and you can set it to automatically boot your camera up once power is connected. It provides both 3G-SDI and HDMI outputs, as well as control and sync outputs. Built-in USB and auxiliary power outputs enable powering accessories and limiting the number of power splitter and converter boxes hanging from your camera. Audio is not forgotten by RED, and the Expander features both an analog stereo input and a stereo headphone jack. It is compatible with the WEAPON 8K S35, WEAPON 6K, as well as the EPIC/SCARLET-W, and the RAVEN. The Expander features a physical switch that allows you to enable the camera to automatically boot up when power is applied. This is a useful feature for when the camera is in a difficult-to-access position. Since the V-Lock I/O Expander communicates with your camera, and allows electronic signals and video output, it requires that your DSMC2 camera has firmware v6.2.17 or later installed. The Expander simplifies your power and output situation when shooting, and can be removed if you want your camera to have a smaller profile for stash-cam, gimbal, or drone shooting. Designed for cable-free mounting to select DSMC2 RED cameras, the RED DIGITAL CINEMA Touch 4.7" LCD features 1280 x 720 resolution. The design of the LCD provides good off-axis viewing up to 160°, with 80° left, right, up, or down so you don't have to be directly aligned with the viewfinder to see an optimal image. The LCD features multi-touch control, with hard navigation buttons on the side. With a brightness level of 400 cd/m² and contrast ration of 1000:1 providing a clear image, the RED Touch LCD mounts directly to your camera without any cables needed between the LCD and your camera. It can mount directly onto DSMC2 cameras including the WEAPON 8K S35, WEAPON 6K, EPIC/SCARLET-W, EPIC/SCARLET M-X, EPIC/SCARLET DRAGON, and the RED RAVEN. A built-in mirror and image flip allow for monitoring while upside down for special applications. The LCD is designed to mount directly to select cameras for cable-free operation. Used in conjunction with the optional DSMC2 LEMO Adapter Collection, you can mount your DSMC2 display away from the camera body. The built-in hinge provides up to 240° of tilt—90° forward and 150° back—which allows the LCD to fold flat on your camera. You can use an optional DSMC2 LEMO Adapter B to mount the LCD to RED EPIC or RED SCARLET cameras. The IDX DUO-C98 96Wh High-Load Battery with D-Tap Advanced, Standard D-Tap & USB Port features a V-mount and is only 2.3" thick, but packs 96Wh of capacity to power your professional devices. It is well suited for handheld gimbal and aerial applications, as well as run-and-gun productions where size and weight can become an issue. Battery data information displays in most camera's viewfinders. The DUO-C98 can handle a combined load of up to 10A among its V-mount, D-Tap outputs, and USB port. One of the D-Taps can also be used to charge the battery, although that requires an optional charger that is not included. Designed with battery circuit protection against overcharge, over-discharge, over-current, and exposure to high temperatures, providing protection to your battery from the rigors of production. A 5-LED battery life indicator on the side of the battery provides a quick visual indication of charge state of your battery. The IDX VL-2X 2-Channel V-Mount Charger & Power Supply supports lithium-ion and NiCad batteries and features three modes of operation. Charger mode provides sequential charging, automatically switching to the second battery after fully charging the first. It delivers up to 2.7A of quick-charge current without the noise of a typical charger thanks to a fanless design. Power Supply mode offers up to 36W of DC power via a 4-pin XLR output. Power Base mode allows you to power the XLR output off of attached batteries, without having to connect the charger to a power outlet. The three modes can only be used independently. This portable desktop charger is designed with reliable internal safety features that protect both the battery and charger from damage should faulty or misused batteries be placed on the charger. It will automatically stop charging if any attached battery reaches an overvoltage condition. Simplify your RED workflow with G-Technology's ev|Series Reader RED MINI-MAG Edition. This card reader accepts RED's proprietary MINI-MAG SSDs and can connect them to a computer and offer quick upload via USB 3.0 or be integrated into your existing G-Technology Evolution workflow through the SATA connection. This RED DIGITAL CINEMA RED MINI-MAG has a capacity of 480GB, is compatible with most RED cameras (may require SSD module), and on select cameras can attain write speeds as high as 300 MB/s. The RED MINI-MAG can support simultaneous R3D and Apple ProRes recording, when used with DSMC2 camera systems. Compatible with DSMC2 camera systems, the RED MINI-MAGs require a RED MINI-MAG Side SSD Module for use with your RED EPIC or SCARLET BRAIN. The RED MINI-MAG system requires that your DSMC is on firmware v5.1.34 or later. The RED Digital Cinema DSMC2 Outrigger Handle mounts to your camera's DSMC2 Top Handle Port, giving you a secure support handle while gripping the camera with one hand, leaving your other hand free for lens adjustments. This handle features an integrated start/stop trigger button in an ergonomically molded grip. Secured to your camera via two cap head Allen head screws, the handles integrated electronic connectors create a cable-free connection. The handle also incorporates fourteen 1/4"-20 threaded accessory mounting holes along the top. The RED DIGITAL CINEMA Hard Case for DSCM2 Camera Package, in black, features custom-cut foam that holds your DSCM2 with mounted Lens Port, DSMC2 Jetpack Expander or V-Lock I/O Expander, and Sidekick or Sidekick Cover. The foam is also cut to accept the RED Touch 4.7" LCD, an Outrigger Handle, Universal Handle, two MINI-MAGs, three DSMC2 OLPFs or a DSMC Battery Belt Clip, a 150W DSMC AC Power Adapter, and a T20 RED TORX L-Key. Please note that this is just the case and the foam; no other items are included. The case is rated at IP67 for dust and water resistance. Integrated wheels create a gliding experience when rolling. A retractable two-stage handle extends from the case, allowing you to comfortably roll it. The spring-loaded top handle easily pulls up, and then snaps out of the way when released. An integrated pressure equalization valve equalizes the pressure differential between the interior of the case and outside air. Box Dimensions (LxWxH) 14.1 x 12.6 x 12.3"
Box Dimensions (LxWxH) 7.9 x 7.45 x 3.8"
Box Dimensions (LxWxH) 9.1 x 5.95 x 2.7"
Box Dimensions (LxWxH) 6.95 x 4.5 x 1.95"
Power Consumption 140 VA max. Quick Charge Current 2.7 A max. DC Output 4-pin XLR / 36 W max. Box Dimensions (LxWxH) 8.4 x 8.1 x 4.1"
Box Dimensions (LxWxH) 6.4 x 4.8 x 2.1"
Box Dimensions (LxWxH) 3.1 x 1.9 x 0.7"
Box Dimensions (LxWxH) 9.2 x 7.9 x 2.6"
Box Dimensions (LxWxH) 22.7 x 14.4 x 9.4"
DSMC2 DRAGON-X Camera Kit (2018 Unified DSMC2 Lineup) is rated 5.0 out of 5 by 2. Rated 5 out of 5 by Luis Arturo from The best camera kit for the new Dragon All you need to get started with the DSMC2 line of products in a well made and thought out case. Everything is well packaged and well made. Is camera kit in there include 18-35 sigma lense? Sigma 18-35mm EF is included with the kit. Is it include sigma 18-35 in camera kit? Sigma 18-35mm EF mount is included with the kit. So the Dragon-X is the new Scarlet? Dragon-X vs Scarlet-W? For us to best assist you will we need to know the exact models of RED cameras you would like us to compare. Feel free to email us directly at askbh@bhphotovideo.com with links to those models. From there we will be able to offer more information. Will this camera operate well in temperatures as low as 15 degrees Fahrenheit ? The operating temperature for this camera is rated between 32 to 104&deg;F. You will not want to use it in temperatures below that. Can i upgrade to the helium 8k Sensor later on with this camera if i decide to? It is all controlled with this type of set up, through the touchscreen. Coming from an M50, would this be overkill for vlogging? If you use this for Vlogging you will be the boss. Many people will envy you. And you arms will become big and strong. Why not offer the same kit with Nikon mount and another lens, if we buy all the kit with Nikon mount is much more expensive than this kit, that is called free choice on equal terms..?